Western accounts of the Soviet-Finnish war have been reliant on Western sources. Using Russian archival and previously classified secondary sources to document the experience of the Red Army in conflict with Finland, Carl Van Dyke offers a reassessment of the conflict. Slavic Review - "In short, this is a first-rate acount of the Finnish War, a readable and well-iillustrated book with many good maps and photos. I highly recommend this work to anyone interested in the history of the Soviet armed forces." "....the significant contribution that Van Dyke has made to the literature on the Winter War...Carl Van Dyke"s new study of the Russian campaign of 1939-40 makes several important contributions to the study of the Soviet side of the Winter War." 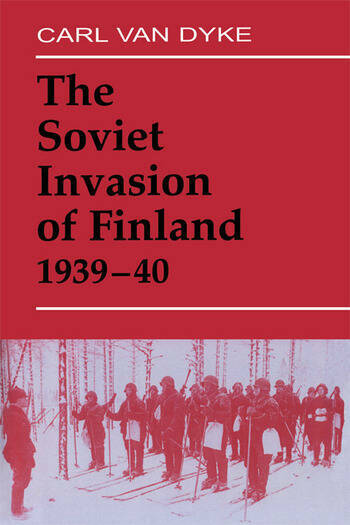 RUSI- " Soviet Invasion of Finland 1939-40 is an inspiring adventure even for a Finnish reader... we do hope that some publisher will be enthusiastic enough to publish it in a Finnish translation, too"
"Overall this is an excellent addition to the study of the Winter War and the evolution of Soviet doctrine." "An impressive book...a very good book that should appeal to a broad range of readership interested in the Russo-Finnish war in particular, and military issues in general."